The first of my mermaid theories is hoaxes. Hoaxes include stuff like the Feejee mermaid exhibited by P. T. Barnum. It was really a monkey and a fish sown together and mummified. He got it from a friend of his in Boston and then created a publicity campaign around it. Barnum circulated a story were he bought the mermaid from a British scientist who had authenticated it. The "scientist", really another friend of Barnum's, was interviewed by the local papers in order to give the thing an air of credibility and heighten public interest. As to the real origin of the mermaid, strangely such things were easily bought by visitors to the far east. They were really just souvenirs brought back by sailors and other adventures looking for a good conversation piece. My favorite of the mermaid theories is "unknown animals". It puts a veil of mystery around an already interesting experience. It explains Columbus' account of seeing three mermaids who were "not as beautiful as had been reported". Since he was off the coast of Haiti at the time what he probably saw were manatees. A mermaid caught off the island of Borneo and put into a large vat was probably some sort of eel. Henry Hudson's account is harder to explain. Some say it was really a walrus or seal, but others point out that Hudson was an experienced sailor who would know a walrus when he saw one. Wishful thinking, or believing is seeing. This one of the mermaid theories relies on the fact that people see what they want to see. Like the 80-year-old man who saw a mermaid in 1947 (that's right, the 20th century). The report of a mermaid with a comely face seen off Britain in 1857. What did they really see? Probably nothing at all. 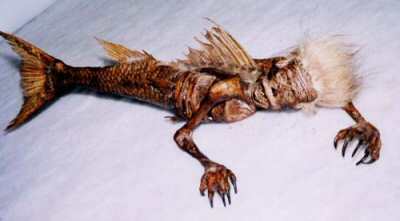 There were reports, with pictures, of a dead mermaid found in Chennai, India, after the tsunami in 2004. The reports can not be traced back to their source which is usually what happens with a hoax. The pictures had already been around for some time before the tsunami anyway. The mermaid in the pictures is basically the same as Barnum's. When Barnum ran newspaper advertisements for his mermaid they showed a picture of an attractive woman with a fish's tail not the ugly little monstrosity from his show. Interestingly, when people saw Barnum's mermaid it was the thing's ugliness that convinced them it was real. Not a logical conclusion but you can see how it must have felt right at the time. Feeling and imagination, not rational thought, are what is important here. This is where mermaid theories blend with wonder. I think Henry Hudson's mermaid really belongs here. Whatever he saw I don't believe that he thought it was a mermaid but I am sure he thought he was clever to call it that. Perhaps Columbus felt the same. After all, who would not want to have a meeting with a dream of beauty and magic like a mermaid?